Extremely smooth sample surfaces and best possible structure preservation. The high quality DiATOME diamond knives are not just perfect for producing ultrathin and semi-thin sections, but also for surface sectioning of all kinds of biological and industrial specimens for AFM investigation. 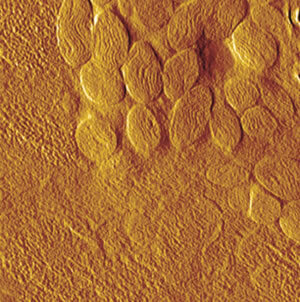 Instead of a section as for TEM, the specimen surface is investigated using AFM. In order to achieve the best results for AFM investigation, only the highest quality diamond knives should be used. Diatome Ultra AFM and Cryo AFM knives are specially tested to ensure that they meet the increased quality requirements of AFM investigations. They produce extremely smooth sample surfaces and guarantee the best possible structure preservation. Available with a 35° angle and a cutting range of 10-100nm, cutting edge length 2mm and 3mm. AFM amplitude image of the muscle of cat's mite Otodectes cynotis. The contrast covers amplitude variation in the 1-3nm range. Size of the whole image equals 4.6microns. Nadejda Borisovna Matsko, Institut für angewandte Physik, ETH Zürich. P.H. Vallotton, M.M. Denn, B.A. Wood and M.B. Salmeron: Comparison of medical-grade ultrahigh molecular weight polyethylene microsctructure by AFM and TEM. J. Biomater. Sci. Polymer Edn., Vol 6, No. 7, pp. 609-620, 1994. N. Matsko and M. Müller: AFM of biological material embedded in epoxi resin. Journal of Structural Biology 146, pp. 334-343, 2004.